As a young mother, I spent way too much time worrying about how to get it all "right' and how to definitely not get it "wrong". Now that my two remarkable daughters are 25 and 29, I am grateful that no matter how it all went, they have resilience and forgiveness in their souls! This morning I had the privilege of speaking with a brilliant young father/visionary who is the main caretaker of his 4 month- young daughter. I am struck by how calm and confident he is, and I find myself wishing that he had been my friend back when mine were tiny. I may have fretted less with him as a role model. I am present to one gift I gave to my girls that I celebrate as a "win-win". It is a mother/daughter journal. I share this idea with parents of burgeoning teens in hopes that it will support them too. When my older daughter became a mysterious, monosyllabic teen, I did not know how to respond. I was harried with 2 jobs, tag teaming with my husband, and feeling a disconnect as I was missing too many family dinners. 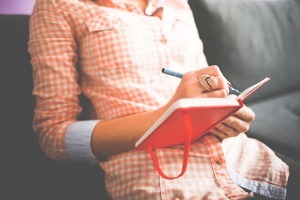 That period of time would be a blur, if I had not asked my teen to share a journal with me. I told her that I missed her, and invited her to take turns writing back and forth. We found a secret place in each of our rooms. When I was finished writing my entry, I would tuck it in her closet. When she responded, I would find it nestled in my bottom dresser drawer. I knew that she was too volatile, and we were butting heads too frequently, for her to hear the real message I wanted her to receive- that I loved her when she was a newborn baby, and I will always love her unconditionally. There was no flawed musical performance , low grade or assessment that would sway me. That her father and I loved her when she was bullied at school, or missing homework, or feeling utterly unlovable. This messaging seemingly got lost in chasing buses, hostile outbursts, tears, and my overwhelming fatigue. Full disclosure: It was often heartbreaking to read the hurt and angst, anger and loneliness that poured from her. At times she lashed out or drew diagrams showing the family ganging up on her. This was shocking, as we all saw her as our oppressor! The journal allowed me to respond after I could sleep on it and present a more adult, loving entry. We continued for a few months- for as long as she was willing. She proved that even in the height of her hormonal tumult, she also sought connection. I did the same with my younger daughter. She was eager and started writing with unbridled enthusiasm, yet our shared journal was abandoned much sooner by her. She has type 1 diabetes, which became thematic in her entries- as it was a burden for a young teen to be saddled with so much self care, glucose swings and resulting disruptions. There were exciting entries too, but she was more likely to share those at the dinner table. The journal was a safety net for the darkness and sadness. We spent this past summer sorting through our attic. Everything from their childhood was stored as I was convinced that I might throw away things that were meaningful. Alas, all the Beanie Babies, American Girl Dolls, trains, wooden toys- stuffed animals, art, books- the relics of their rich childhood held much less meaning for them than for me. They barely looked at those items and I felt, in a word, ridiculous. I had an unhealthy attachment to their past. The treasures they both hold onto and delight in are those journals chronicling their angst filled teenage years. They can trace so much about themselves through this unique lens, and they bear witness to the extraordinary love I felt and feel for both of them. A couple of stuffed animals, a bin of artwork, and the journals made the cut. And, on a certain level, I am vindicated! You do not have to be a gifted writer to participate in this intimate connection with your teenager. You do have to be prepared to share a positive message during some challenging times. I like to think you will try it with your sons as well. Birthday, Valentine's Day, Christmas, Bar or Bat Mitzvah- I urge you to give it when the time is right in your life, and see what transpires!